Webshop-Danmark Review 2019: Is Webshop-Danmark a Good Hosting? 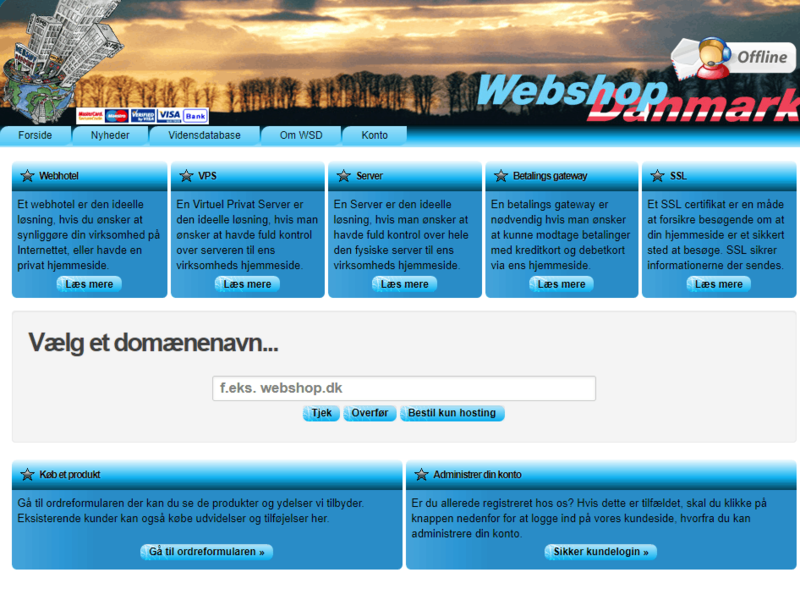 Webshop-Danmark offers a simple range of hosting services from its out-of-date website. The prices are okay, but the customer service is pretty much non-existent. Webshop-Danmark appears to have been founded in 1995, although it’s not overly clear. Its website is extremely basic, quite outdated, and is only provided in Danish. These shared hosting plans include all of the regular features you’d want in a hosting plan such as FTP access, MySQL databases, and support for PHP, plus some value-added features like SSH access and Cron jobs to ensure your website runs optimally. There’s a one-click installer which includes more than 300 programs that can be installed with a couple of clicks, as well as compatibility with all of the regular CMS programs like WordPress, Joomla!, and Drupal. While the shared plans are relatively comprehensive, if you need more resources, there are VPS packages available which give you the option to choose between various Linux distributions e.g., Debian, FreeBSD, Fedora, Ubuntu, and CentOS – all in the latest versions. I do have some reservations, however. When I visited the website, the live chat was always offline, despite being during business hours, and the news section of the website has not been kept up to date. In fact, the most recent post was in 2014! The prices are okay – in line with similar companies. Be sure to consider that the base plan doesn’t include most of the value-added features (SSH access, a domain name, Cron jobs, PHP, and so on) and the resources are low (5000MB disk space), so you’ll most likely need to upgrade to one of the higher tier plans. Despite the website appearing outdated, you are able to purchase the hosting via the website and the process is surprisingly smooth. The plans can be purchased in three, six, or 12-month plans, without a long term discount, but there is a 14-day money-back guarantee. Customer service is so limited it’s almost non-existent. If you like to research solutions on your own, you’re out of luck, as the knowledge base only has a handful of documents – nowhere near enough to solve your problem in the event of any technical issues. Furthermore, when you try to contact the company, you are directed to a login page. Obviously, if you’re not an existing customer, it’s impossible to log in. Finally, while there does appear to live chat, it was offline when I visited the site on several occasions- it didn’t even let me send a message. Suffice it to say, I was unable to get in touch with the company at all. It’s a shame because I’d like to get some more information about the features. It’s hard to tell the status of Webshop-Danmark. The website is outdated but you can still purchase the hosting plans online, which I’d recommend doing with some caution. Wondering how Webshop-Danmark stacks up against other Web Hosting companies? Enter any other Web Hosting company and we will give you a side-by-side comparison.